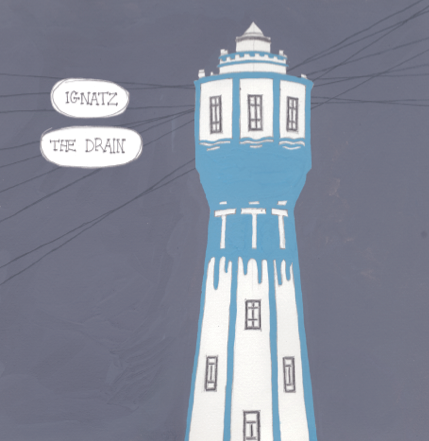 For the last decade, Belgian guitarist Bram Devens has been releasing solo recordings under the name Ignatz. A couple of cassettes have come out in the States, but most of his releases have been elusive imports. Thus, we have taken it upon ourselves to do a public service and release a domestic version of an LP that will appear on the (K-RAAK-K) label in Belgium. This must be something like the sixth or seventh studio album Ignatz has cut, and it’s a remarkably solid slab of mysto-folk/blues invention. There are more vocals than noted on previous Ignatz slabs we’ve encountered, and they manage to remind us of everyone from early Townes Van Zandt (“The Watertower”) to Karen Dalton covering“Play with Fire” (“People in This Town”). The way Bram’s voice lazily combines with the loose guitar playing sometimes makes the album sound like a mutant hybrid of early Jandek and mid-period Hurley. The rhythms and melodies go in and out of focus with a beautiful irregularity that demonstrate them to be the work of a true original.